Although the recent economic expansion of countries in Asia and the Pacific has been steady, it is modest compared with the recent historical trend owing to prolonged weak external demand, rising trade protectionism and heightened global uncertainty. At the same time, decades of rapid economic growth, facilitated by globalization and technology, came at the expense of rising inequalities and environmental degradation. Addressing such economic, social and environment challenges in a coherent and decisive manner will be critical for the region’s future. 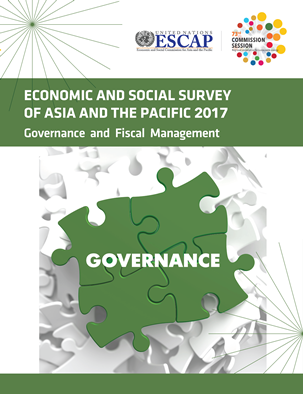 In view of such challenges and the terms of the 2030 Agenda for Sustainable Development, the Economic and Social Survey of Asia and the Pacific 2017 highlights the importance of better governance and effective fiscal management. In particular, it is found in the Survey for 2017 that the quality of governance affects development outcomes through its impact on the composition and efficiency of public expenditure. At the same time, weak governance partially explains the low levels of tax revenues in several countries in the region. Governance has impacts on the way public revenues are raised, especially its effects on tax morale, as the willingness to pay taxes is affected by perceptions of how well tax revenues are used. It is argued in the Survey for 2017 that transparency and accountability in public administration can be improved and strengthened by ensuring the production of and access to key data and information, and by developing public administration capacities to monitor, evaluate and audit policies and actions. Inclusive institutions, where public service beneficiaries can exchange views with the Government, could also be instrumental for raising tax revenues and making expenditures more efficient. The Survey also highlights the role of e-government, information and communications technology and decentralization in improving governance in the context of fiscal management. In the Survey, it is further emphasized that the potential benefits of better governance are large and wide ranging, including better health outcomes in the Pacific, economic diversification in North and Central Asia, decent jobs in South and South-West Asia, ecological innovations in East and North-East Asia and the narrowing of development gaps in South-East Asia. The first chapter of the Survey for 2017 provides a macroeconomic assessment of the region, with a discussion of risks to the economic outlook, and it highlights the importance of improving the quality of economic growth. A case is made for a proactive role for fiscal policy and supporting structural reforms not only to enhance economic potential but also to strengthen social protection and improve resource efficiency. The second chapter provides a more disaggregated analysis of economic issues and indicates that the potential benefits of better governance and effective fiscal management are large and wide-ranging, including: better health outcomes in the Pacific; economic diversification in North and Central Asia; decent jobs in South and South-West Asia; ecological innovations in East and North-East Asia; and narrowing development gaps in South-East Asia. The third chapter contains a study of the relationship between governance and various dimensions of sustainable development; the study delves in detail into analysing the role of governance in improving fiscal management and contains a discussion of a range of policy options to improve the quality of governance in support of better fiscal management. Social protection in Asia and the Pacific -- why now and where do we stand? 1.2. Why is governance relevant?